New Digital Humanities Books in the Scholarly Commons! Is there anything quite as satisfying as a new book? We just got a new shipment of books here in the Scholarly Commons that complement all our services, including digital humanities. Our books are non-circulating, so you cannot check them out, but these DH books are always available for your perusal in our space. Two media studies scholars examine the history and future of digital humanities. DH is a relatively new field, and one that is still not clearly defined. Berry and Fagerjord take a deep dive into the methods that digital humanists gravitate towards, and critique their use in relation to the broader cultural context. They are more critical of the “digital” than the “humanities,” meaning they consider more how use of digital tools affects the society as a whole (there’s that media studies!) than how scholars use digital methods in humanities work. They caution against using digital tools just because they are “better,” and instead encourage the reader to examine their role in the DH field to contribute to its ongoing growth. Berry has previously edited Understanding Digital Humanities (eBook available through Illinois library), which discusses similar issues. For a theoretical understanding of digital humanities, and to examine the issues in the field, read Digital Humanities. Working with data can be messy, and text even messier. It never behaves how you expect it to, so approaching text analysis in a “tidy” manner is crucial. In Text Mining with R, Silge and Robinson present their tidytext framework for R, and instruct the reader in applying this package to natural language processing (NLP). NLP can be applied to derive meaning from unstructured text by way of unsupervised machine learning (wherein you train the computer to organize or otherwise analyze your text and then you go get coffee while it does all the work). This book is most helpful for those with programming experience, but no knowledge of text mining or natural language processing is required. With practical examples and easy to follow, step-by-step guides, Text Mining with R serves as an excellent introduction to tidying text for use in sentiment analysis, topic modeling, and classification. No programming or R experience? 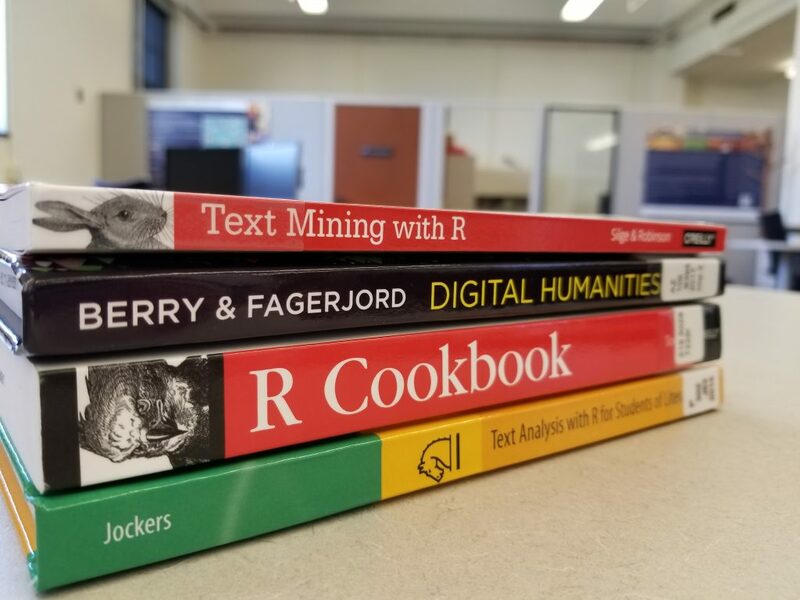 Try some of our other books, like R Cookbook for an in-depth introduction, or Text Analysis with R for Students of Literature for a step-by-step learning experience focused on humanities people. Visit us in the Scholarly Commons, 306 Main Library, to read some of our new books. Summer hours are Monday through Friday, 10 AM-5 PM. Hope to see you soon! This entry was posted in Digital Humanities and tagged books, critique, R, Text Mining by Kayla Abner. Bookmark the permalink.